Bluebonnet’s 100% Natural Whey Protein Isolate is sourced from grass-fed cows that are not treated with antibiotics or recombinant bovine growth hormone (rBGH), also known as bovine somatotropin (BST). Additionally, whey protein has the highest biological value (BV) of any protein on the market, which refers to a protein that has all of the essential amino acids in adequate quantities to sustain growth and development. That’s why Bluebonnet’s 100% Natural Whey Protein Isolate uses high-quality, microfiltered whey protein isolate with important, naturally-occurring immunoglobulins, which help support the immune system. Whey is also a rich and natural source of branched chain amino acids (BCAAs) and glutamic acid. 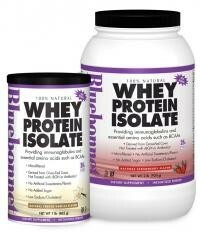 Bluebonnet’s 100% Natural Whey Protein Isolate provides fast-acting protein meaning its amino acids are easily and readily available to the body for immediate use - an especially important consideration for athletes to use after exercising to optimize the recovery phase by quickly replenishing the body’s amino acid pool.